This year for Holy Week and Easter Sunday, our resident graphic artist, Kenneth Wilson, created two very special images for the First United Methodist Church of Clyde. The first is a drawing of several symbols of Holy Week, all interwoven together. There is a depiction of the three crosses where Jesus and the two criminals were crucified on Good Friday. Above the middle cross hangs a sign which indicates the charge against Jesus: “This is Jesus, the king of the Jews.” Below that is a reminder of the scene we’ll celebrate of Easter Sunday, which is the empty tomb with large stone which has been rolled away. Next to that is a lamb, which is symbolically what Jesus is for us: a sacrifice, slain to cover the sins of all mankind. All of these images are in the context of a picture of a giant Lion, which is another symbol of the nature of Jesus. 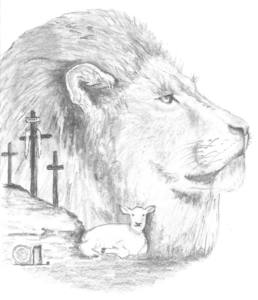 We are reminded by this image that Jesus is both the conquering Lion of the tribe of Judah and the sacrificial Lamb. 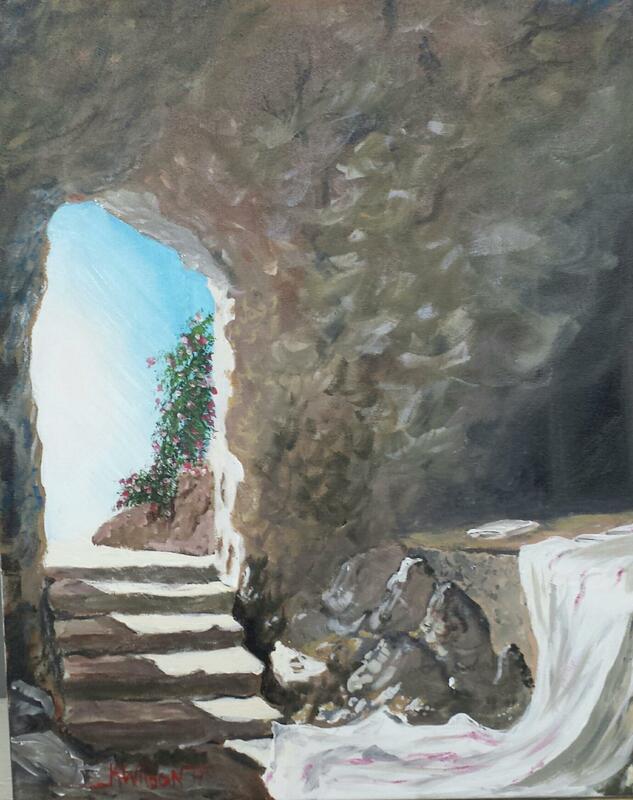 The second image will be used on Easter, which is a depiction of the inside of Jesus’ empty tomb. The burial clothes are discarded, but the head dress is neatly folded, signaling that Jesus was finished with death, that he had conquered the grave, but he was coming back. These images will be proudly displayed on Easter Sunday in the church foyer. Please, stop by and view them before or after our 10:30 UNITY worship service that day.